There's still about a month before Universal Pictures' Pitch Perfect 2 opens. But don't worry, aca-awesome fans, here are some fetching young things with bright smiles, legs for days and great voices to enjoy in the meantime. And like the original sleeper hit from 2012, there's a dash of camp in this song-and-dance video, which doubles as a promotion for the May 15-debuting sequel and an ad for the Schick and Skintimate brands. The movie's stars don't appear—instead, it's a college a cappella group called Basic Pitches. Actress Brittany Snow will be involved in a larger tie-in campaign that includes product placement in the flick, new product launches, contests and giveaways. 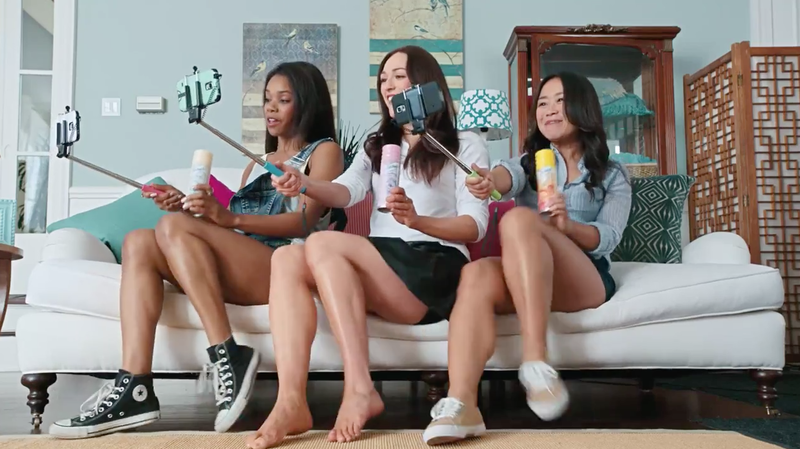 The video comes from JWT New York, Adam Shankman (Hairspray, Rock of Ages) and Oscar-winning cinematographer Mauro Fiore (Avatar), with cheesy lyrical twists that turn Icona Pop's "I don't care—I love it" into "My leg hair—I shaved it" and the diva theme "Bang, Bang" into an ode to bathroom selfies and personal grooming. That's how you rock your legs, ladies. Project Name: Schick and Pitch Perfect 2 present "Ready, Shave, Shine"